As the European economy continues on its slow-to-no-growth path, European acquirers are looking for M&A opportunities in North America where growth prospects appear more promising. Europe has acquired over $150bn worth of M&A targets in the United States (US) and Canada in the last twelve months to November 2014 (LTM 2014), almost four times the value compared with the previous twelve months (LTM 2013) and the highest since before the global economic downturn. For the LTM 2014 period, Europe was the most common inbound M&A partner to the US, accounting for over 40% of inbound deal count and approximately 50% of deal value. Industrial, information technology (IT), healthcare, consumer and business services have been the most active M&A sectors, accounting for the majority of transatlantic deal count. 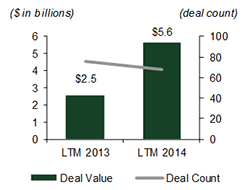 Source: Dealogic announced M&A transactions. Real GDP growth for 2015 is forecast at 3.2% in the US, up from an expected 2.2% in 2014, providing investors and potential buyers with confidence that the US economy is on a stable growth trajectory. The top three European M&A partners to the US are UK, Germany and France, each forecast to have lower GDP growth rates than the US in 2015. Source: Economist Intelligence Unit and E&Y. European corporates are using cash on their balance sheets and / or accessing the relatively liquid equity and debt markets, driving demand for multi-billion dollar deals. European headquartered private equity firms also have a substantial amount of dry powder and are increasingly looking to North America to deploy capital through their buy-and-build platforms. Baird expects transatlantic M&A activity to continue supported by the established trend of North Americans acquiring in Europe and also driven by the recent trend of Europeans acquiring in North America. Higher economic growth in North America compared to Europe will force European buyers to further embrace outbound M&A and globalisation. 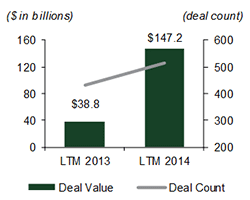 Selected M&A transactions shown. Please visit rwbaird.com/investment-banking for a list of all transactions.